A Facebook version of Civilization was announced back in October, but word has come from Sid Meier & Co. that the beta won't be available until June. Firaxis announced last year that they were developing a application for Facebook called Sid Meier's Civilization Network which would allow you "to create the world's most powerful, richest, smartest, or just plain coolest civilization." 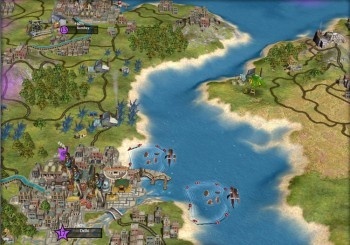 The release said that Firaxis was planning on bringing the beta to the social networking site "soon." That was in October and it's now February. Ah, this is obviously some strange usage of the word "soon" that I wasn't previously aware of. Take-Two Interactive, who publishes the Civilization games since they bought the rights from Infrogrames back in 2004, said that the beta for Sid Meier's Civilization Networkis delayed, possibly until June. I suppose that this could be construed as good news. The combination of two of the world's most effective time-wasting applications has been pushed back, allowing some work to be done for the next few months. Alright, back to work. Those mines aren't going to sweep themselves!